The Green Bay Packers have signed S Matt Giordano to their active roster today, releasing S Aaron Rouse. They also signed T Dane Randolph to the practice squad. 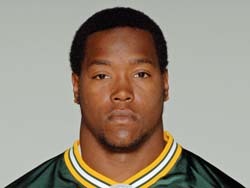 Rouse (pictured), a third-round selection in the 2007 NFL Draft, appeared in 27 career games with the Packers. An injury to Atari Bigby in week one gave Rouse a start last week against Cincinnati. But Rouse had to leave the game after receiving a neck stinger. Giordano is a 5th year pro. He spent the past four seasons with Indianapolis, playing in 55 games and starting six. The fourth-round selection from California in 2005, will wear No. 47 with the Packers. Randolph spent training camp with the Packers as a non-drafted free agent from Maryland. He replaces Jamon Meredith, who was signed off the Packers practice squad by the Buffalo Bills.